Founded in 2007, The Independence Fund® is a Charlotte-based non-profit committed to empowering our nation’s severely wounded, injured, or ill Veterans to overcome physical, mental, and emotional wounds incurred in the line of duty. We are dedicated to improving the lives of our nation’s Veterans and their families. Through our Mobility, Adaptive Sports, Advocacy, and Caregiver programs, as well as a willingness to adapt to specific health needs, we strive to create a culture in our organization where Veterans and their caregivers can rely on us to provide unmet needs. We ensure that the services we render focus on the goal of giving our Veterans the best mobility device options available, as well as promoting their mental and physical health. The Independence Fund® also serves the Heroes behind the Heroes: the caregivers who work tirelessly to support wounded Veterans day-in and day-out.The Independence Fund® is devoted to assisting Veterans and their families in transforming their lives towards a better future. Join our mission and be a Hero for a Hero®! 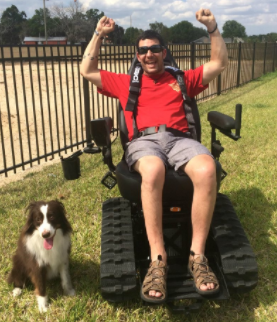 We have awarded almost 3,000 mobility devices, including all-terrain wheel chairs and adaptive bikes, to Veterans nationally!